Sainsbury's has introduced a new(ish) flat bread couple of months ago and it is fantastic! Miles better than any pitta bread you can buy from a high street supermarket. The bread is a folded softer version of pitta bread (higher fat content, judging by the paper packaging). 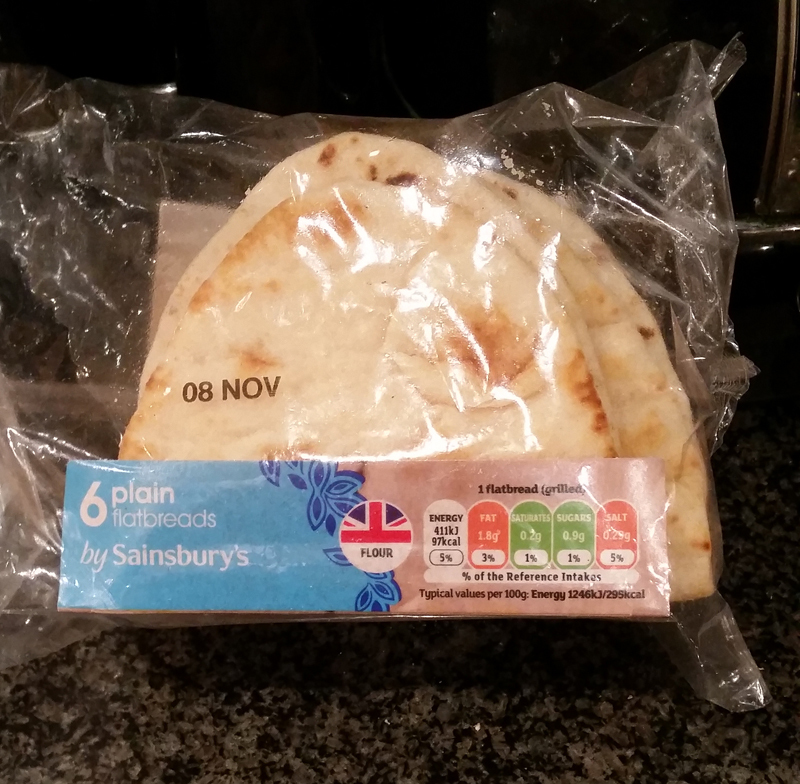 Its two layers are too thin to be opened as a pitta pocket. You need to to fold the bread over the sandwich stuffing. I usually fill the bread with pastrami, cheese and American mustard and toast it in a frying pan with some butter on the outside to make a perfect toastie. Alternatively, stick it in a toaster until crisp and use it for dips and hummus. 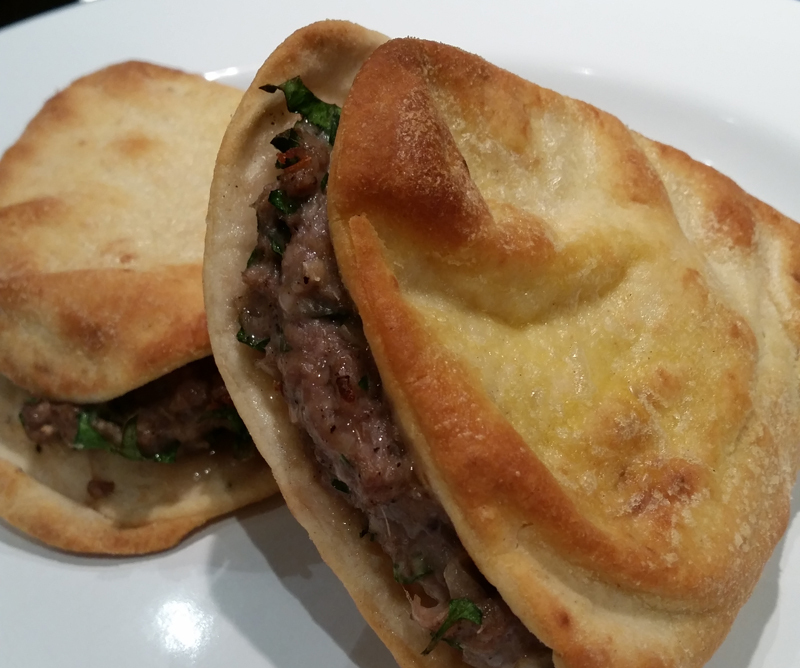 However may absolute favourite way to use this bread is to stuff it with kebab meat (or kafta for the Lebanese inclined! )and stick it in the oven. This dish was my favourite part of an Arabic barbecue dinner as a kid and is still my number one choice for a solo dinners (since my wife finds mince lamb too fatty). I often make a big patch of kebab meat and stick it in the freezer in small bags. Perfect emergency dinner!. This dish is eaten all over the Middle East. It is called Arayes in Lebanon and Hwawshi bread in Egypt.While in Aleppo the add some white cheese and call it Toshka. In Damascus I don't think we have a specific name for this dish and it doesn't usually feature on restaurant menus. It is just bread stuffed with kebab meat. Start by chopping the onion as small a humanly possible. Salt generously in a deep bowl and leave to soften for half an hour. It is worth taking your time at this step as there is nothing worse than a mouthful of chunky uncooked onions. Add the meat, parsley, allspice, salt, pepper and chilli flakes to taste. Cook a small bit .of the meat in a frying pan and taste to check the seasoning. Stuff the bread with the meat mixture to your liking. I prefer a thick layer of meat to keep it pink in the middle. Butter the bread on the outside and cook on a wire rack in the middle of the oven for 10-20 minutes depending how you like your meat. happy to see you back. the recipe is superb as it's. we have a look alike recipe in banyas, except for one thing. we add a minced tomatoes. we call it *maria*. WE have Maria in Damascus, Seem ingredients (mince meat, parsley, onion and tomato) but on an open face Fatayer rather than between layers of bread. Syrian food Meet up in London! We should organize!!! i fell in love with syrian food 10 years ago and ever since i started cooking your blog is my favorite cookbook : ) the recipes are so simple and the taste is deliciousss! big up! Where would you recommend I can get kadayif noodles from in London? Want to try making knafeh @ home! It sounds really good, thank you so much for sharing! How does one contact you via email?